Having a successful billing cycle depends a lot on the processes and systems you use in your practice to mitigate insurance claims and billing. And, when it comes to your claim management options it typically comes down to two options: managing in-house with a clearinghouse solution or outsourcing to a billing service. What works best for one practice isn't necessarily the right solution for another. If you have a rockstar biller(s) in your office, the right clearinghouse solution might give them the tools they need to efficiently and quickly stay on top of your claim cycle. But, if your practice struggles with things like high biller turnover, a high volume of claims to keep up with, or a lack of transparency into claim performance - a billing service might be your best option for maximizing on your reimbursements. 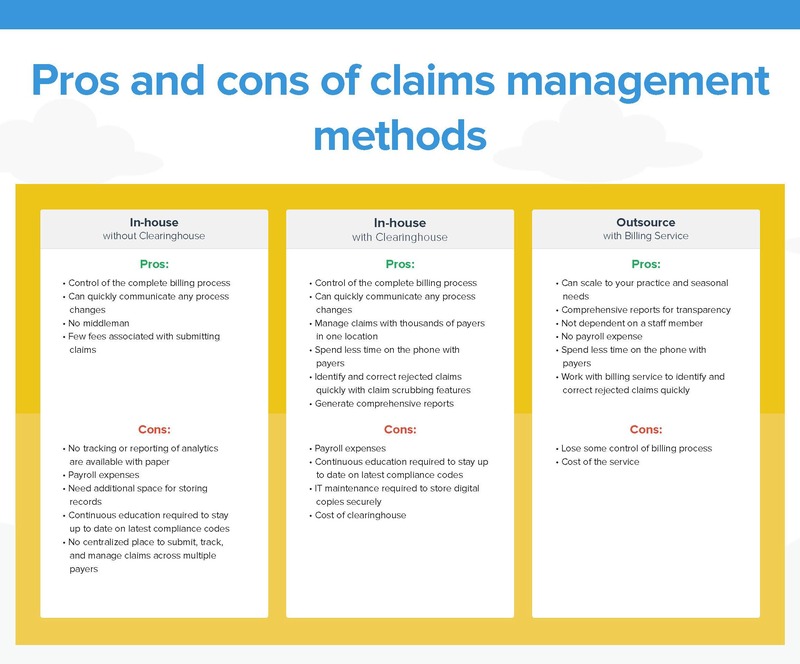 In our latest eBook, The Definitive Guide to Making More Money on Claim Reimbursements, we put together a quick chart highlighting the pros and cons of different claim management options every eyecare practice has. If you've been struggling to weigh your choices, this chart can help you better evaluate your options. Or, check out the full eBook for all the details on making more money on claim reimbursements. Learn more about the right solution for your practice by downloading our definitive guide eBook.